Want to be notified of new releases in diego-treitos/linux-smart-enumeration? This project was inspired by https://github.com/rebootuser/LinEnum and uses many of its tests. Unlike LinEnum, lse tries to gradualy expose the information depending on its importance from a privesc point of view. 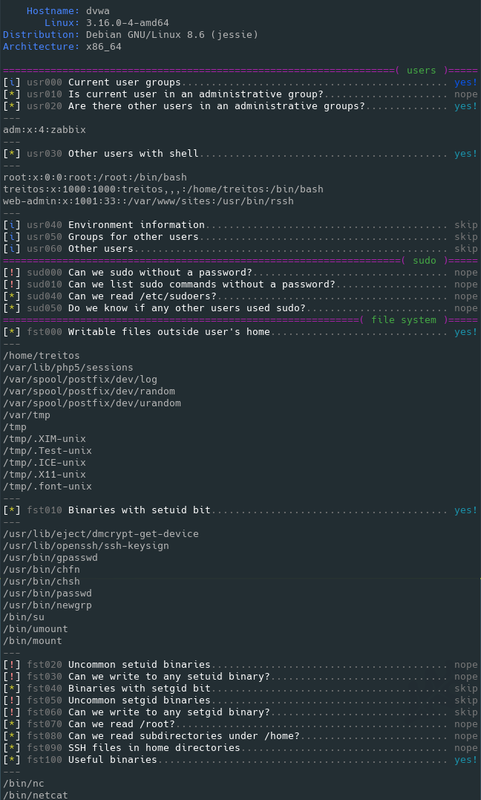 This script will show relevant information about the security of the local Linux system. It has 3 levels of verbosity so you can control how much information you see. In the default level you should see the highly important security flaws in the system. The level 1 (./lse.sh -l1) shows interesting information that should help you to privesc. The level 2 (./lse.sh -l2) will just dump all the information it gathers about the system. By default it will ask you some questions: mainly the current user password (if you know it ;) so it can do some additional tests. The idea is to get the information gradually. First you should execute it just like ./lse.sh. If you see some green yes!, you probably have already some good stuff to work with. If not, you should try the level 1 verbosity with ./lse.sh -l1 and you will see some more information that can be interesting. If that does not help, level 2 will just dump everything you can gather about the service using ./lse.sh -l2. 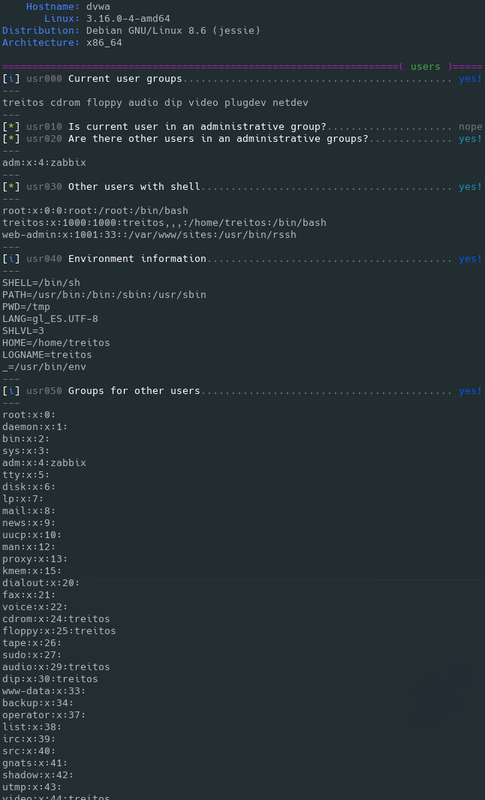 In this case you might find useful to use ./lse.sh -l2 | less -r.
You can also select what tests to execute by passing the -s parameter. With it you can select specific tests or sections to be executed. For example ./lse.sh -l2 -s usr010,net,pro will execute the test usr010 and all the tests in the sections net and pro. 2: Show all gathered information. 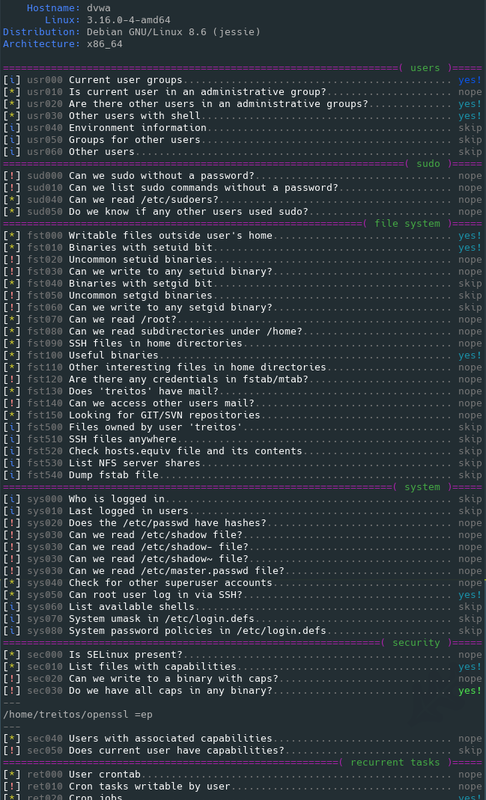 fst: File system related tests. sec: Security measures related tests. ret: Recurren tasks (cron, timers) related tests. ctn: Container (docker, lxc) related tests.